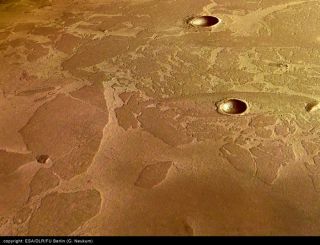 The European researchers used pictures from Mars Express, analyzing the depth and shape of craters and other terrain to infer the underground ice blocks. A European space probe has found evidence for large blocks of water ice just beneath the Martian surface in relatively warm conditions near the equator. The frozen sea of sorts, if follow-up studies confirm it, would be the first large quantity of water ice on Mars confirmed to exist near the equator, researchers say. And it would be a good place to search for present life. "This is a historic moment for Mars exploration when a previously neglected region reveals its secrets," Jan-Peter Muller of the University College London said in a statement today. "Speculations that this area might have water close to the surface have been shown to be correct." The findings could be important for biology, Muller and his colleagues say. "Higher levels of methane over the same area mean that primitive micro-organisms might survive on Mars today," the statement reads. Small quantities of methane were previously detected in the Martian atmosphere by the European Space Agency's Mars Express orbiter. Methane could be a byproduct of biological activity, or it could be the result of nonbiological processes, other scientists say. And the methane signature at Mars is tentative for now, researchers have said. "The methane signature is controversial," Brown University geologist John Mustard told SPACE.com last week. Scientists know that Mars was once wetter than it is today. Data from NASA's Mars Rovers reveal significant amounts of liquid water must have existed billions of years ago. Since then, the planet has dried up. Scientists have been eager to determine how much water might have remained beneath the surface, either as ice or in occasional pockets of liquid that might support life. The newfound pack ice, just five degrees from the equator, might have collected millions of years ago when volcanic tempests and water floods brought it down from nearby areas in the Elysium region of the planet, researchers say. Scars to the landscape serve as evidence of those past floods. Until now, however, scientists had assumed any lakes or seas that resulted from the flooding had either evaporated away or, if frozen into icebergs, had "sublimated" directly into the atmosphere. "We have found evidence consistent with a presently existing frozen body of water, with surface pack-ice," the scientists write in a paper that is scheduled to be published in March in the journal Nature. The journal's contents are normally not released prior to publication. The research was first reported on by New Scientist magazine, which says the paper was not under embargo when first viewed by the magazine. SPACE.com has reviewed the paper. The research was discussed yesterday at a scientific meeting in Europe. "The fact that there have been warm and wet places beneath the surface of Mars since before life began on Earth, and that some are probably still there, means that there is a possibility that primitive micro-organisms survive on Mars today," study co-leader John Murray at the Open University in the UK said in today's statement. "This mission has changed many of my long-held opinions about Mars - we now have to go there and check it out." Many other scientists have said firm proof of life on Mars, if it exists, would require a new mission. The rovers on Mars and spacecraft orbiting there are not equipped to find life directly. The ice exists in a block that resemble polar ice on Earth, according to the research team. It measures about 497 by 559 miles (800 by 900 kilometers) and averages up to 150 feet (45 meters) deep. The underground iceberg is just 2 million to 5 million years old -- recent in geologic terms. It formed when early hominids were roaming Earth. The feature suggests that "vast flooding events, which are known to have occurred from beneath Mars' surface throughout its geological history, still happen," the Muller, Murray and their colleagues write. "The presence of liquid water for thousands of millions of years, even beneath the surface, is a possible habitat in which primitive life may have developed, and might still be surviving now. Clearly this must now be considered as a prime site for future missions looking for life." The researchers propose that the ice has been protected from sublimation by an overlying layer of volcanic ash. "I think it's fairly plausible," Michael Carr, an expert on Martian water at the U.S. Geological Survey, told New Scientist. "We know where the water came from," said Carr, who was not involved in the work. "You can trace the valleys carved by water down to this area." Evidence from the High Resolution Stereo Camera on the European Space Agency's Mars Express craft show characteristics in craters that suggest the water ice remains. The pack-ice floes appear to have drifted into obstacles and become grounded on islands when the water level dropped, the scientists say. But the case is not closed. "The question remains as to whether the frozen body of water is still there, or whether the visible floes are preserved in a sublimation residue draped over the substrate," the scientists write in their journal article. A firm answer could come soon. The Mars Express probe will finally deploy its delayed MARSIS experiment in May. The ground-penetrating radar instrument is designed to look for ice or water beneath the surface. "If water ice is confirmed, this site represents a prime target for exobiology landers from the European Space Agency planned for the end of this decade," today's statement said. If the ice exists, it would add to other frozen water stores on Mars. Both polar regions of the red planet are capped by large areas of water ice. In the southern hemisphere, frozen carbon dioxide, or dry ice, covers the water ice. NASA's Mars Odyssey probe found strong evidence for ice embedded in the soil away from polar regions, but scientists are awaiting confirmation of the extent of that ice. Researchers stress that while liquid water is a key ingredient for life as we know it, the presence of water does not mean life ever got started.